Mercedes-Benz’s goal at the Mobile World Congress (MWC) 2019 in Barcelona. Here the focus was to be put on the company’s numerous digital advancements made possible through its recent cross-group initiative with [email protected] . For the fourth time in a row, jangled nerves has designed the Mercedes-Benz presence at the innovation show CES in Las Vegas. With a general focus on encounter and dialogue, the central auditorium forms the epicenter of architecture and content. The show gives all perspectives on the world premiere of the intuitive and intelligent multimedia system “MBUX – Mercedes-Benz User Experience“ and further introduces trend-setting show cars. The auditorium becomes yet another hotspot for CES future mobility topics, as it also hosts the interdisciplinary series of lectures “me future talks” by Mercedes-Benz. 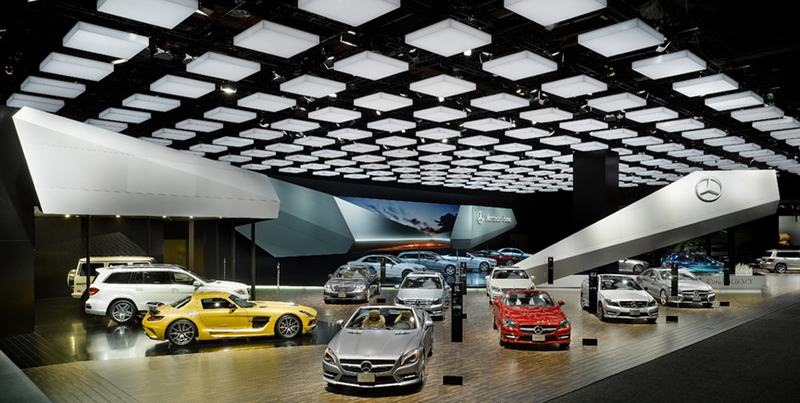 In 1957, Mercedes-Benz became the first European car manufacturer to exhibit at the most important U.S. auto show: the NAIAS in Detroit. In 2017, Mercedes-Benz underscored the longstanding international commitment of its brand and its special affinity with the American market. At the Detroit Auto Show in 2017, Mercedes-Benz celebrated the best sales in the company’s history and its top position in the premium market segment. One significant variable in this winning formula: AMG, a brand that’s extremely popular in the U.S. So what better place to kick off the AMG anniversary than at the Detroit Auto Show 2017! 50 Years of Driving Performance: To celebrate its anniversary, AMG presented the impressive Mercedes-AMG GT C Edition 50, which jangled nerves cast as the protagonist in a spectacular anniversary film. The idea: Tell the story of 50 fascinating years of AMG based on emotions, not the date on the calendar. How? With futuristic scenes filled with all the intensity and character of AMG. When jangled nerves goes to an A-list trade show with Mercedes-Benz, it always puts the brand center-stage and emphasizes brand design. For example, the large LED screen is much more than a flat display area. It’s a digital extension of the physical trade show happening all around, tapping into the corporate design, building on everything with the right media. The new Mercedes-Benz E-Class Coupe was showcased in a unique choreography between the vehicle itself and the Silver Flow display. To really bring the media into the foreground across the entire area occupied by the company at the trade show, lighting was used to create the right mood. To present the electric models in the Mercedes-Benz family, fiber optics in the flooring interplay with the backdrop on the LED screen. And what was the highlight? The fully electric Mercedes-Benz concept vehicle “Concept EQ,” which projects the impressive Mercedes-Benz success story into a new age of connected travel. When it comes to brand experiences, what could possibly be more personal than to actually go and pick up your own Mercedes-Benz straight from the factory? 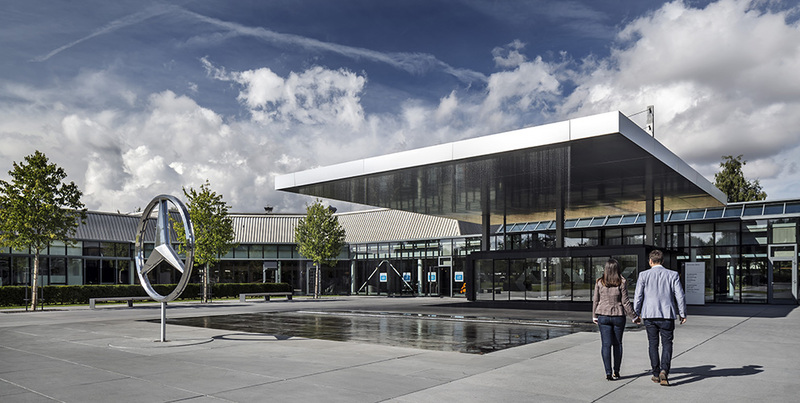 Thanks to the recent redesign of the customer centre in Sindelfingen (south of Stuttgart), a whole host of brand values can be experienced first-hand – with everything that’s smart and emotional about the brand itself, plus everything that’s sensuous and vivid about its design philosophy. 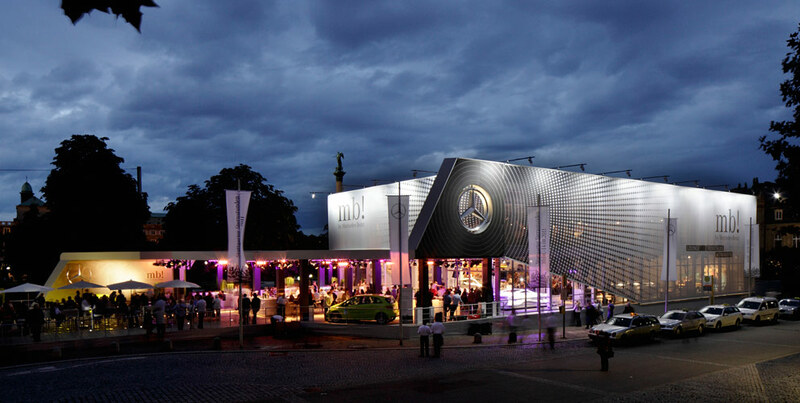 With an alluring lounge, restaurant areas, inviting shops and novel exhibits waiting in every corner, no wonder visitors soak in that feeling of modern luxury, the indulgence that no other brand represents like Mercedes-Benz. As you approach the new customer centre from the motorway, it already starts flying the flag for the most prestigious factory in the Mercedes-Benz production portfolio. Originally designed to serve as a gatehouse, the building is now a subtle yet eye-catching venue that turns the spotlight on each key campaign as it comes and goes at the company. The square outside the customer centre is often used to stage events or presentations in the summer, and with the Mercedes star gleaming proudly up above this piazza, the defining feature of the Mercedes-Benz company suddenly feels like a familiar friend –especially with so many people sending souvenir photos and selfies with the star around the world. Inside the centre, visitors find a number of attractions that mostly revolve around the visitors themselves, literally unfolding around them and beseeching them to come discover more. Glance outside and the building is surrounded by a leafy backdrop, making it feel like a pavilion in the park. The materials are traditional and worked by hand, magically dovetailed with digital media and lighting which is all designed to accentuate the important differences that bring the brand values and design philosophy of Mercedes-Benz to life, all housed in rooms that were also designed to be different. 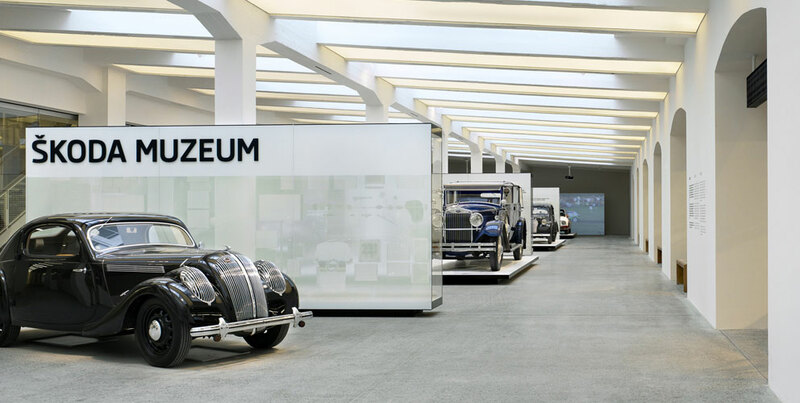 Many of the design features that were developed here are now practically part and parcel of the corporate architecture of Mercedes-Benz. The building was two years in the planning, plus another two to complete – despite everyday activities going on all around. Then in December 2016 it was time to inaugurate the customer centre as the new flagship gateway to the plant in Sindelfingen. How important is money in society? What role does money play for the individual? Why do we spend so much time thinking about money? In fact, what is money anyway? Everybody thinks about money in a different way, with different expectations depending on whether you’re a child, an adolescent or an adult. The Erste Financial Life Park – or simply FLiP – is a free-to-enter, barrier-free and independent exhibition revolving around the topic of money and finance. 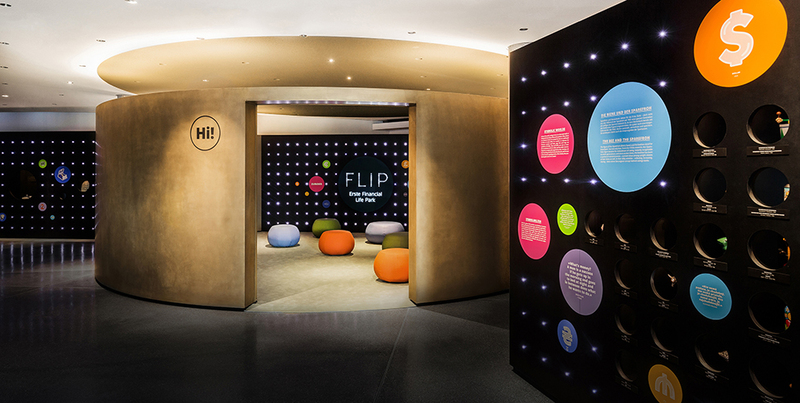 Located opposite Vienna’s world-famous Belvedere Gardens, FliP is like an educational tour on the Erste Campus, itself situated within the new headquarters of Erste Group Bank, which is now one of the biggest banking groups in central and eastern Europe. Why there? So that people working at the bank can relax and meet up, but also for customers and curious visitors to explore and discover the world of money. FLiP occupies 1500 square metres (16,000 sq ft) on three separate floors. Its installations include various interactive displays, but also themed stations, a library, and a special seminar and workshop room. Overall, this creates a place of playful exploration – a chance to ponder over sometimes complex issues. Visitors are given their own personal tablet to browse through more detailed information, take part in team games or solve quizzes all by themselves. There are three tours to choose from, each guiding the visitor through FLiP from a different angle, with specially adapted content and varying levels of detail. The overall FLiP experience revolves around separate modules: depending on the chosen tour, each station can be mixed and matched with any of the others. The stations may offer different ways of sharing information – each description is tailored to the theme – but the thread of continuity stays the same throughout: the world of finance, from people’s personal saving preferences to the banking system and global networks. The aim of FLiP is to encourage people to think more consciously about how they use money, to enhance people’s personal money skills, and to bolster ‘financial literacy’. FLiP is therefore not only about sharing information – it turns complex topics into a personal experience, allowing you to actively discover things in an environment brimming with real or representative situations. 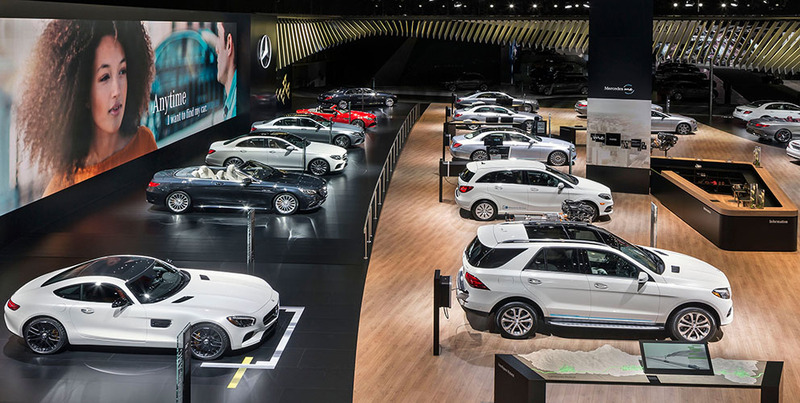 Mercedes-Benz decided to leverage the 86th Geneva International Motor Show as an opportunity to kick off the open-air season and showcase its Dream Car Collection. The centrepiece of its stand was the new C-Class Cabriolet. In total, 37 vehicles were presented between the 1st and the 13th of March, including five world premieres and five European premieres. The Silver Flow display extended over the entire 33,580 sq ft stand, connecting downwards to the stage area through a central media installation. This formed a visual welcome to the back of the installation, playing with different display elements to provide a horizontal canopy plus a vertical facade. The impact of the Silver Flow from afar was immediate, also thanks to the LED screen used. The vehicles that premiered at the event were positioned on a highlight area in front of the screen. The area opposite the stage at the centre of the trade fair stand was used to showcase innovation topics with interactive display units for visitors. Another eye-catcher near the front of the stand was a presentation revolving around the Mercedes Maybach and Intelligent Drive. Playing to the dynamic lines of the Silver Flow, visitors were directed to areas next to and behind the main stage to explore Mercedes AMG und Mercedes me. It was all about trying things out, meeting people and discovering new worlds. 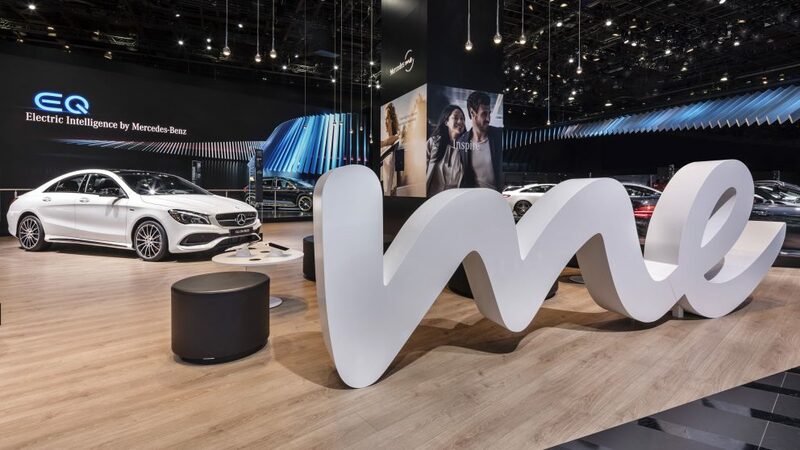 To this end, Mercedes-Benz used different forms of communication on a part of the stand that was specially put aside for trade fair visitors, allowing them to get to know the variety and individual options offered by Mercedes me. From the cafe on the upper level, visitors could also enjoy a captivating overview of the entire trade fair stand. Mercedes-Benz celebrated a number of world premieres at the North American International Auto Show (NAIAS): its new E-Class, the new Mercedes-Benz SLC and the Mercedes-AMG S 65 Cabriolet. What better way to ring in a year of soft tops and roadsters. To mark the occasion, all the big highlights were to be found at a single venue. 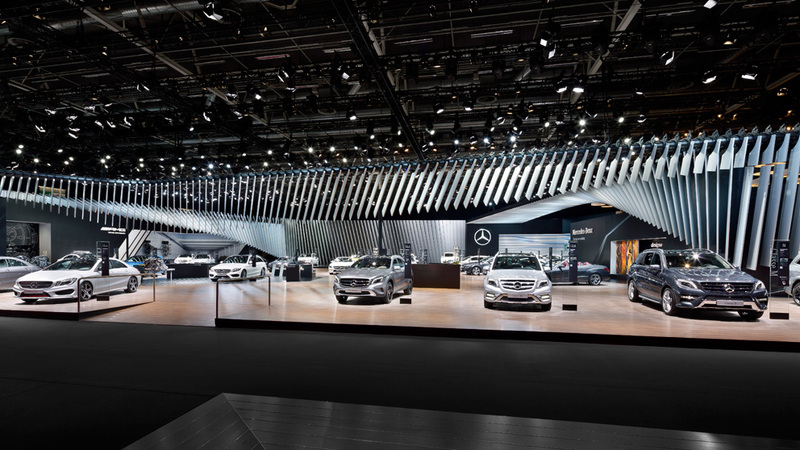 To build on the theme of NAIAS 2015, the Silver Flow design was used once again, creating a clear demarcation line around the stand and leading directly into the resulting space, presenting a seamless visual link with the area in the centre. The result: plenty of room and a true sensation of space, bridging the gap between the outer and inner areas of the stand. To the rear of the stand was a unicolour backdrop, contrasting with the Silver Flow display, where cars were showcased on the stage. The background was also an integral part of the Mercedes-AMG space. The large stage and the LED display were totally in keeping with the look and feel of the new E-Class – certainly a winner with visitors, with its groundbreaking driver assistance system and its world-class operating concept. 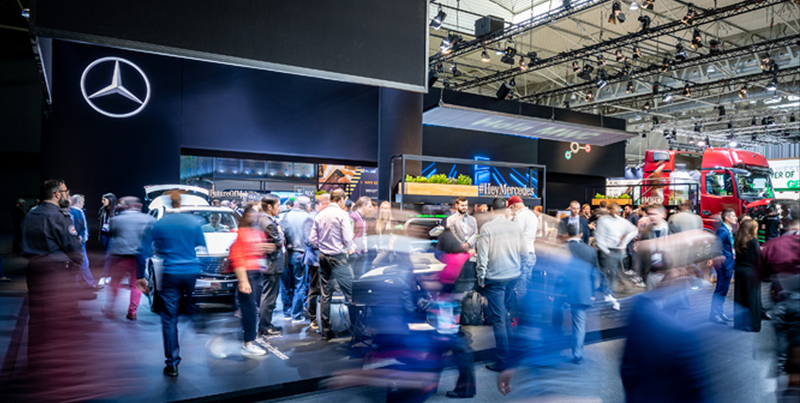 To blend in and complement the display on the LED screen, the business limousine featured a variety of specially developed modules covering intelligence, safety and car interiors – again a hit with visitors, who were immersed in the world of Mercedes. 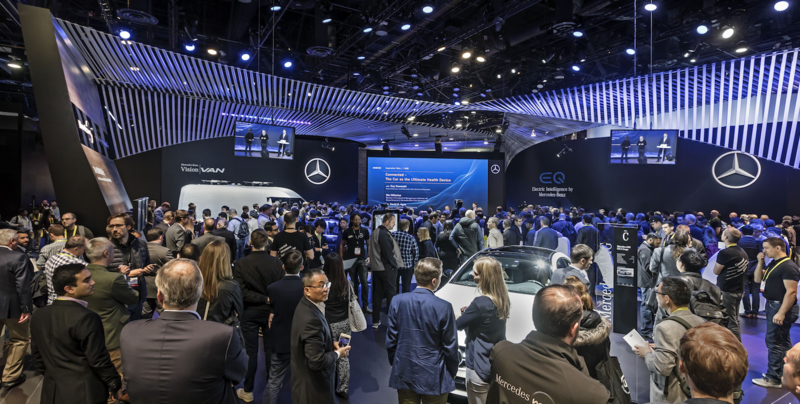 The Mercedes-Benz stand at CES Las Vegas 2016 revolved around the company’s new Mercedes me solution, a technological advancement that merges modern mobility with the digital world all around us. Another highlight during the show was a teaser for the new E-Class, which was about to celebrate its world premiere no less than a week later at NAIAS in Detroit. 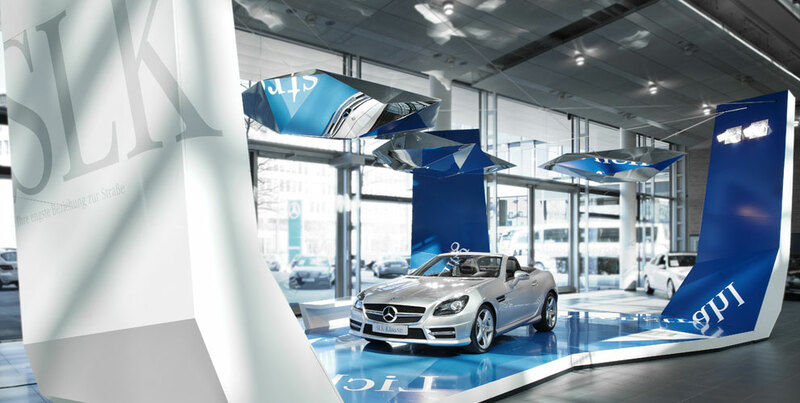 The sweeping Silver Flow display enticed passing visitors away from the trade fair plaza directly into the welcoming arms of the world of Mercedes me. The plaza itself captured the imagination with variety and multiplicity, creating a special display area for showcasing highlights on an oversized LED screen, along with plenty of space for special presentations. This was a good opportunity to display the Concept IAA show car, with additional room for information units and vehicle presentations. To bring the innovative cockpit of the new E-Class to life for visitors (with its high-resolution screens, ultra-sensitive touch control technology and state-of-the-art smartphone integration), they were enticed by specially designed furniture – offering them the chance to enjoy and experience this new development before its official world premiere. Again, the Silver Flow was used to play with the light, matching the mood by individually alternating the illuminative effects. At the same time, the Silver Flow created a canopy that attracted trade fair visitors from afar. After its foray into the future, the Silver Flow moved back to the present day and the world of Mercedes me. 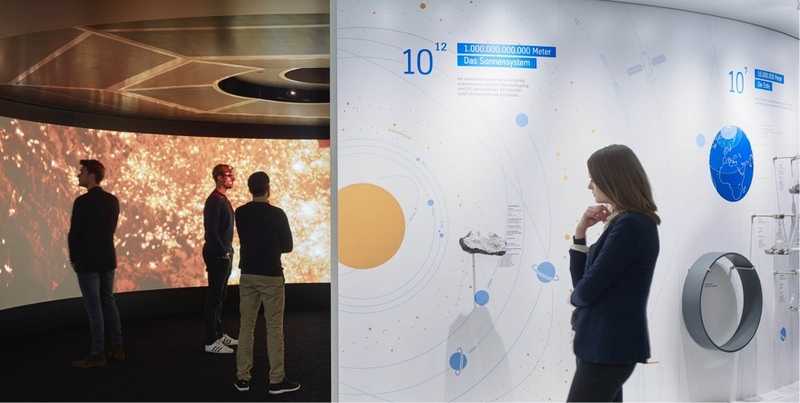 Panels on the wall were used to bring the many facets of Mercedes me to life, whilst a ‘touch-table’ with embedded screens and iPads allowed visitors to explore the app. The aim of the Linden Museum’s shadow theatre exhibition was to showcase previously unseen items as well as recently rediscovered collection pieces. The mysterious interplay between light and shadow is not only treated thematically, but is further transformed into spatial design. This design is oriented towards the extraordinary theme of this interplay: An exhibition room that is kept stringently black with areas illuminated by white spotlights. Only the content that is meant to be communicated – exhibits and texts – is presented on these surfaces. By means of carefully directed lighting, the rare and historical shadow puppets are specially accentuated. A breathtaking quality in both attention to detail and aesthetics, allowing visitors to sense for themselves what it really feels like to be in a shadow theatre. Accompanied by lifelike scenes and laden with emotion, with invitations for visitors to try things out themselves, the exhibition brought the rich history of narrative tradition to life, with music, song, images and video sequences transforming a museum visit into an experience of the senses. 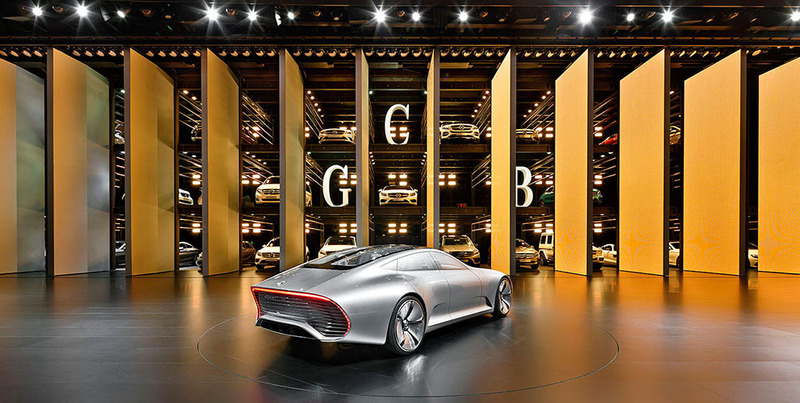 When Mercedes-Benz lifted the curtain on the world premiere of its F 015 Luxury in Motion at the CES Las Vegas in 2015, it also unveiled an inspiring vision of the future, a taste of things to come beyond the features of autonomous driving. This was a vision of future travel underscored by a meaningful message: the future will not hinge on technology, but on human beings and imagination. This principle formed the backbone of the entire exhibition concept for Mercedes-Benz at the CES. High-tech, fast-moving communication; inspirational, authentic actions that were both intelligent and emotional – the trade stand placed people on the pedestal, a reflection of the underlying philosophy of the F 015 Luxury in Motion, which had already caught the eye of observers around the world. Three parallel stages were set up, like an extension to the central plaza – three choices facing the individual. 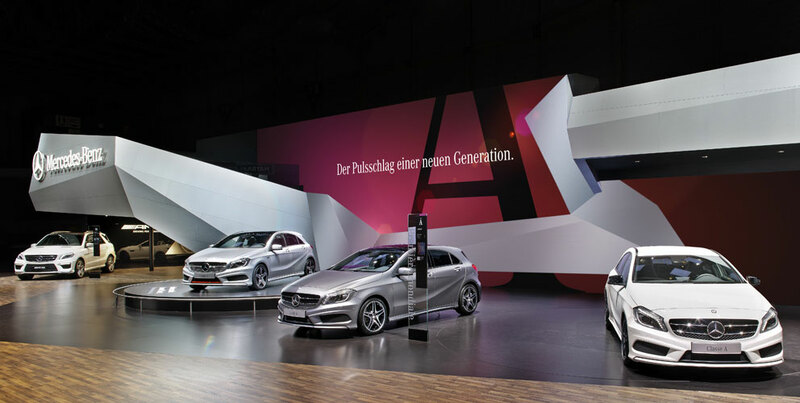 The messages conveyed and the interactive trade stand units acted as a vehicle of live dialogue between the engineers and designers of Mercedes-Benz and the intrigued visitors to the trade show. To reflect this theme, the stand was futuristic in appearance yet defined by a clear visual identity, marrying the inviting area marked by premium quality with spaces that beckoned the visitor to invest time and thought. 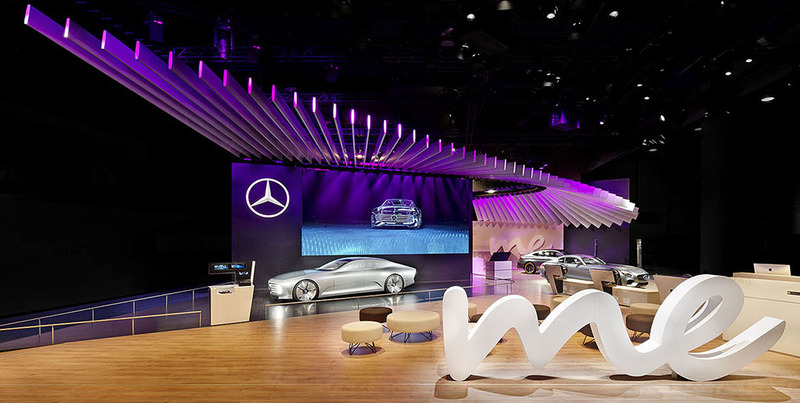 The 2014 Paris Motor Show was an opportunity for jangled nerves to raise the curtain on its new trade fair concept for Mercedes-Benz: the Silver Flow, a striking design element destined to add movement and energy to any stand. Consisting of a series of silver fins, the Silver Flow adds emphasis and presence to a stand, combined with a touch of sophistication and elegance. This sweeping stream of silver provides a structure that is both continual and adaptable, simultaneously luring visitors from afar and helping to define different areas within the stand. The Silver Flow consists of 300 individual aluminium fins, each measuring up to 7.5 metres in length and creating a huge, flowing sculpture that lends an unmistakeable air of spaciousness. Given the vitality these fins add to the stand and the way they sweep across the stage, it’s hard to believe that in total they weigh an amazing 21 tons. To achieve the visual effect, a special tying mechanism had to be created to obtain the different angles and hold the shape. The overall sculpture can also be used for media projections. With animated light projected onto the fins, the Silver Flow appears to move, adding dynamism to the cars. This effect transfers seamlessly onto a huge LED screen, creating the impression that the entire (real and virtual) flow is indeed in motion. The overall impact of this concept is that each design element on the stand is transformed into its own medium; altogether, the media become part of the architecture – a fascinating interplay between physical objects and effects. 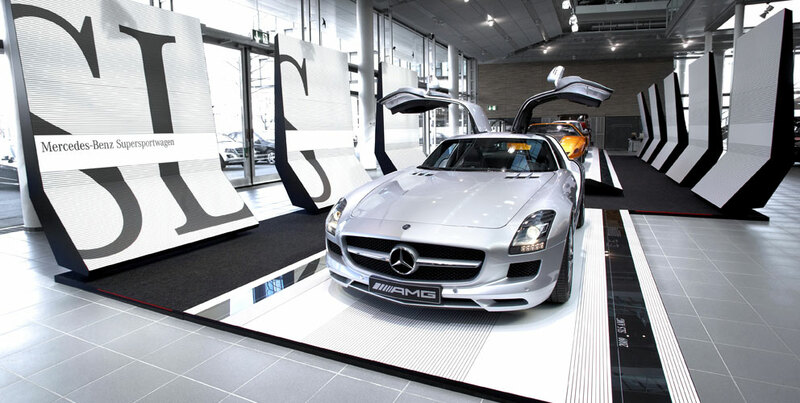 Wherever it’s used at a car show, the Silver Flow ensures that brand presentation is consistent and coherent. The adaptability of the fins means the metallic sculpture can match the specific context but at the same time reinforce recognition every time it appears in public. At the beginning of the 21st century, mobility and the social expectations placed on it are in a state of transition: electric drives, interconnected transport concepts and sustainable energy production create new mobility. 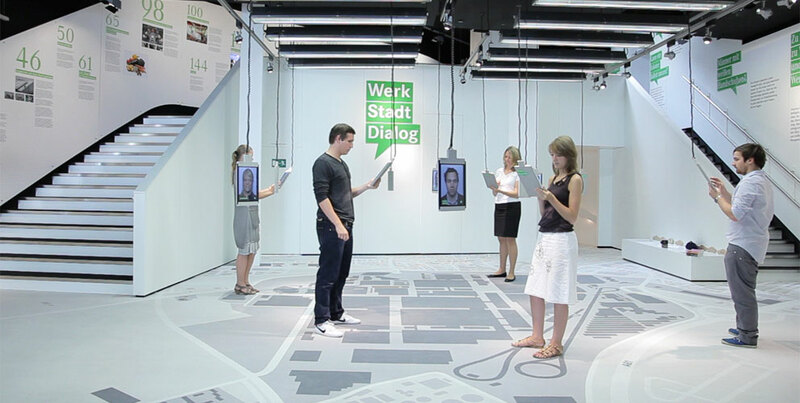 The eCUBE has been designed as a point of interest that provides information about the challenges involved in mobility in transition and clearly illustrates the innovative solutions that scientists and traffic planners from Baden-Württemberg are exploring and implementing. Based on a modular quadratic structure, the eCUBE is designed in a minimalist stylistic language and has the shape of a cuboid. This allows the focus to be on its content. An additional area on the side that protrudes from the cuboid forms a spacious and inviting entrance. The inside walls of the eCUBE display large graphics on the topic of mobility. In the centre the visitor will find the “Nukleus”, a media installation that illustrates the specific mobility situation and future-oriented concepts. The information pillars outside the eCUBE, with touch panel and hands-on exhibits, provide insight into the current projects in Baden-Württemberg. Mobility as the central theme of the eCUBE does not just inform the concept of the content and how it is conveyed, it was also taken into consideration for the eCube’s formal design. 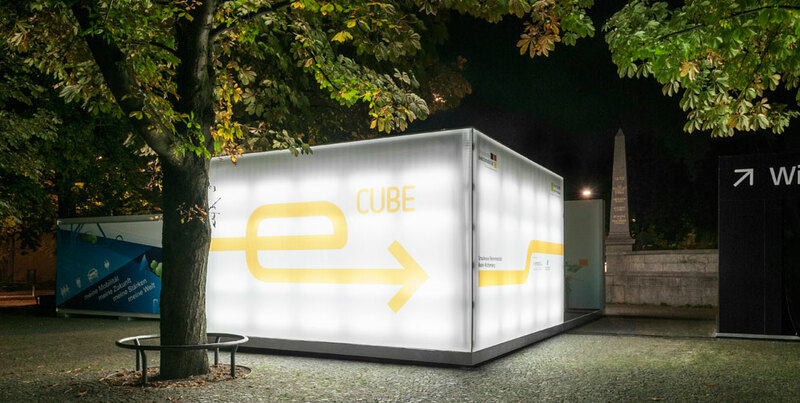 Because the eCUBE will be installed in several locations throughout Baden-Württemberg during its tour, special attention was paid on the cuboid to be easy to install and disassemble to keep it mobile. Light-coloured wood and black shiny glass characterise the impressions of the room, creating homogeneity within a space that is required to fulfil multiple tasks. Evenly and harmoniously, the wood sweeps from the entrance to the bistro. Like the room itself, it fulfils various functions: it serves as wall covering, furniture and was used for the doors that blend in so directly to the creative environment. The glass surface opposite functions as a multimedia “magic screen”. Back-lit logos are present, alongside integrated monitors and touch screens. The two courtyards are also given a fundamentally new interpretation, incorporating functional and creative elements. One of them is covered over and converted into an indoor space. This enables it to be used for small exhibitions, for example. The modular doors can open up the courtyard to the adjacent room and connect the two. The second courtyard is ideal for spending time outdoors. The so-called “Markenhaus” acts as a distinctive, symbolic feature: its minimalist design and concentrated detail evoke the origins of the Schwäbisch Hall brand.